The Essteele Per Sempre 30cm Open French Skillet combines premium quality materials with world renowned Italian engineering to create beautiful, chef-choice cookware. The thick, fast-heating core allows the pan to heat the base and all the way up the sides simultaneously, giving this cookware perfect heat control and optimum performance. Our most popular size, the 30cm skillet is versatile for every type of home chef, no matter what cuisine takes your fancy. 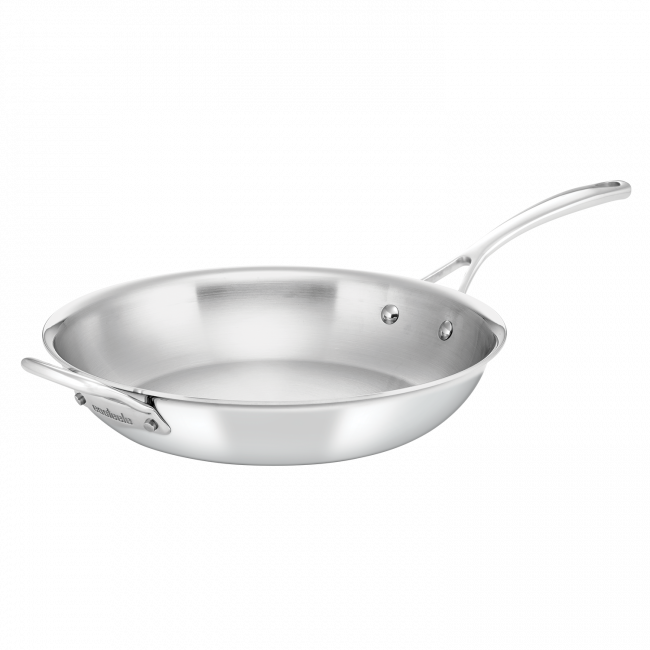 Essteele Per Sempre 30cm Stainless Steel Skillet is rated 4.5 out of 5 by 4. Rated 5 out of 5 by malibu701 from Great pan.... great service! Awesome pan. Bought this one and 2 of the saucepans. Very nice. Very easy to clean. This pan had a very slight warp in it and was replaced promptly under warranty. Very impressed with the service. Rated 5 out of 5 by Lyndon from Beautiful finish. Gives a great sear. Bought this a month ago and I could not have hoped for a better pan. Stainless steel does stick but that's the main reason why chefs love them. It creates a great sear and is built like a tank. I can see this last for 20 plus years. Rated 4 out of 5 by kayabo from No good for flat surface cooktops I bought this about seven months ago to use on induction cooktop, but unfortunately bottom of this frypan is not completely flat, has got little peak in the centre and wobbles on the flat surface. It would be great pan for gas cooktops.